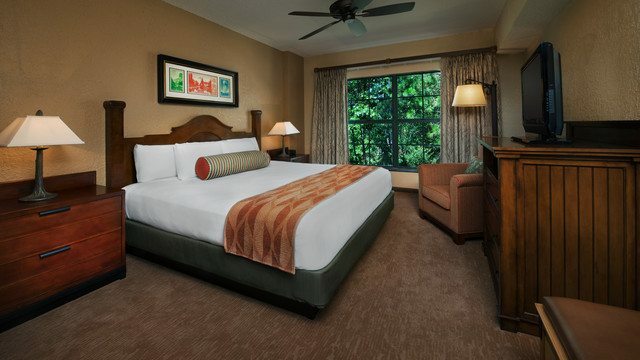 The Villas at Disney’s Wilderness Lodge is inspired by early 20th-century lodges of America's national parks. Enjoy the splendor of the great outdoors with creeks and nature trails through pine forests. It has some of Disney World’s best restaurants including Artist Point and Whispering Canyon Cafe. From this resort guests can take a boat ride to the entrance of Magic Kingdom. Guests can enjoy the easygoing Boulder Ridge Cove Pool or the playful Copper Creek Springs Pool complete with hot and cold whirlpool spas and a 67-foot waterslide built into rocks. For more information, please see Guide to Disney's Boulder Ridge Villas at Disney's Wilderness Lodge. Deluxe Studio Villas feature one full bathroom and accommodate up to five Guests, plus one child under age three in a crib, and include a kitchenette, queen-size bed, double-size sleeper sofa, pull-down bunk sized bed, flat-panel TV, DVD player, and private balcony.